Borough Under 16s celebrate their county cup success. Peterborough Rugby Club’s junior section again did the Fengate club proud when winning three Cambridgeshire county cup finals on Sunday. 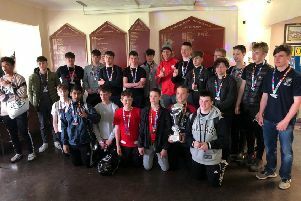 The club’s Under 16, Under 15 and Under 14 teams all returned home from finals day with silverware to place in an already bulging trophy cabinet down at Second Drove. The Under 16s, who have already won the East Midlands League Premier Division title and are through to the East Midlands Cup final, beat a strong Cambridge team 31-21 with a gritty and determined performance in their final. Borough won the Under 15 final against Saffron Walden 21-0 and the Under 14s triumphed in a closely contested final against Cambridge 12-7. The club’s mini and junior section chairman Matt Throne said: “To have one talented squad in a club section is one thing, to have three age groups being crowned county champions is quite another.